Cher turned 70 last week (March 20, born 1946). 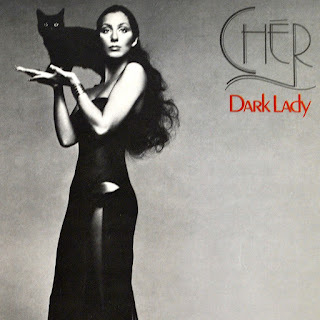 One of my friends and I were talking about our favorite Cher songs, and we both decided our favorite is "Dark Lady." This song was a hit in 1974. It's a fun song, so retro, and it tells a story. (Regular readers will know that I love songs that tell a story!) This song was written by Johnny Durrill of The Ventures. (You may remember The Ventures from songs like "Walk, Don't Run" and "Hawaii Five-O.") The song has been called a "murder ballad." It tells the story of a woman who goes to see a fortune teller in New Orleans to see if her boyfriend is cheating ... only to realize he is cheating with the fortune teller! This song made it to the top of the Billboard chart. What is your favorite Cher song? I'd love to hear from you in the comments, below. I had never heard this Cher song before! Thanks so much for sharing. I loved the animation! I always looked forward to watching the Sonny and Cher show back in the 70's. Cher has certainly had an eventful life. Hard to believe she is 70 years old! Thanks for stopping by! Mary, I agree -- I was also surprised to hear that Cher was turning 70. We LOVE Cher. Her music has inspired us and so has her fashion sense. Yes! Those fabulous Bob Mackie dresses from the 1970's and 1980's.